If that technology sounds simple in this day and age, that’s because it is. So perhaps that’s the reason that the “simpler” the table is (as in, completely manual operation), the more expensive it tends to be. Rigs that might appear to be awfully “plain Jane” are generally going to be more costly than units that, for instance, have extra features like allowing for hookup to a computer and the conversion of analog LP tracks to digital music files via a built-in preamp. 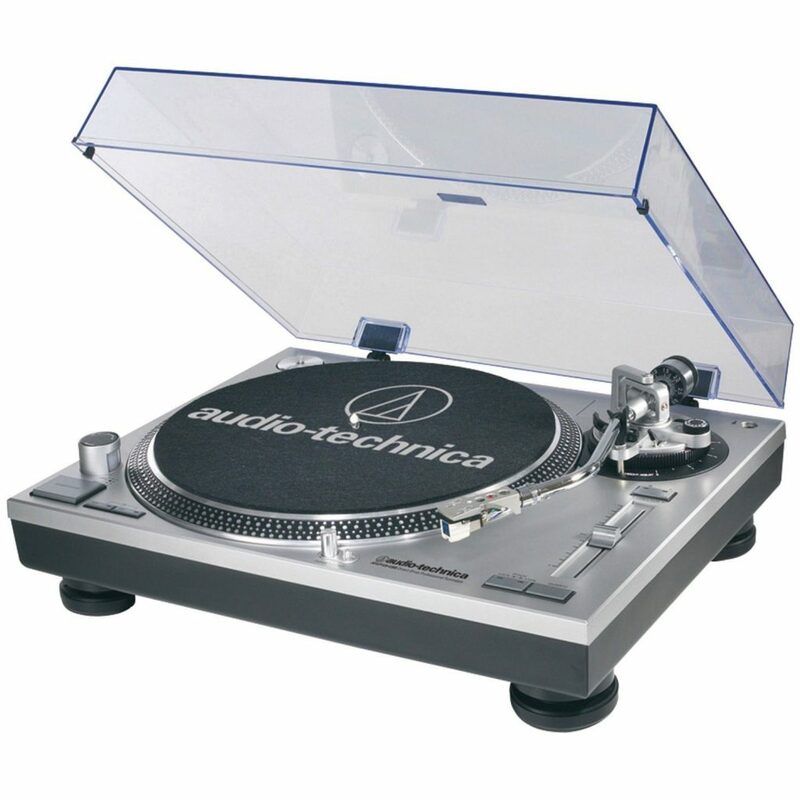 But there are exceptions, and one quite notable one is the very popular and highly praised Audio-Technica AT-LP120-USB, a table that defies that trend in a bold way. It sounds as good as its chief competitors, but it doesn’t look or act like them at all. We’re here to go through the features of this model, rate it vs. comparable, more expensive and cheaper tables (even some other Audio-Technicas), and tell you why, for right around $250, it’s more than worthy of consideration by vinylphiles. The AT95E cartridge included with the 120 is one of the best – if not the best – cartridges you will find at this price point or even considerably above it. It is a 3-speed turntable. It’ll play standard 33⅓ LPs, 45s and, if you’re the kind of enthusiast who dabbles in the olden days, it will spin 78s as well. 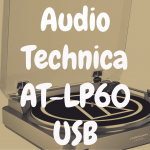 (The 120’s main competitors, including Audio-Technica’s own AT-LP 60, are limited to two speeds). It is a direct-drive model. Instead of using a belt, the standard operating method in this price range, the die-cast aluminum platter is connected directly to the motor. Many who are supposedly in the know say that the speed will be more consistent with direct-drive, but it’s an ongoing argument that will probably never be settled. Once again veering from the pack, the 120 has a built-in preamp and easily hooks up to a computer via USB. The included (and quite user-friendly) Audacity software allows for vinyl tracks to be converted for burning to CD or loading onto music-playing devices. Note that with the simple flick of a switch, it can also operate with the preamp in a receiver. Unlike its baby brother (the AT-LP60), the 120 is a fully manual table. The listener must lift the tonearm and place the stylus into the first groove, then lift it again when the record side is finished playing. Many vinyl fans feel that this kind of involvement in the music-listening process is one of the special joys of being involved with records. Finally, this looks and feels like a sturdy component. The plinth (base) is made of metal, not plastic, a la the 60. The controls are metallic as well. Not surprisingly, the thing is quite hefty, weighing in at more than 23 pounds. It’s a well-made product that’s decidedly not in the bargain-basement strata. The 120 is a sophisticated device, not “plug and play” like so many others. The components of the tonearm must be assembled and adjusted. That includes balancing the arm and setting the appropriate stylus tracking force and anti-skate (the mechanism that prevents the arm from sliding over the record and making one of the most hideous and heartbreaking noises in all of human history). Clear instructions are included, and video help is available. It may sound complicated, but it’s really not. It is, however, quite exacting. If you do it wrong, you’ll know it immediately. For example, if the arm isn’t balanced or the anti-skate is incorrect, the stylus will not track properly. If the stylus pressure is too low, there will be tracking problems as well. 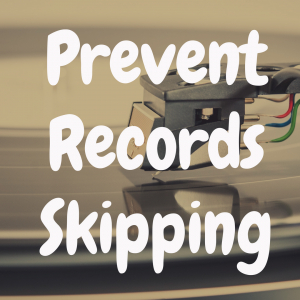 If it’s too high, you’ll be running the risk of damaging your precious vinyl. In short, if it tracks right and sounds right, it probably is right. The legendary (and long-gone) Technics 1200 was the granddaddy of the industrial-strength turntable, designed to withstand a night of drinking and debauchery at a party or nightclub. 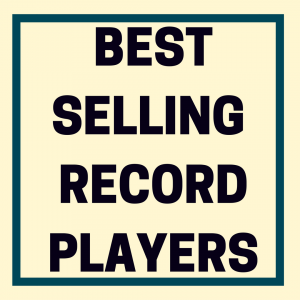 The Audio-Technica players are successfully following on those large footsteps. Since the AT-120 is a direct-drive turntable, it better fits DJ needs. For one thing, it starts and stops faster. For another, it has pitch control. It will even play a record backwards. None of this means that it won’t be perfectly at home in a living room playing soft chamber music. Some “regular” turntable users simply like the way these machines look. For about $200 more than the 120, the Rega RP-1 is a more traditional “audiophile” kind of table – certainly in terms of looks. 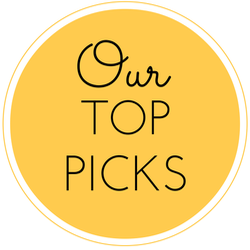 Highly rated by both critics and users alike, it is an utterly refined rig designed with the simplicity in mind that we talked about up front. It is all-manual, belt-driven, doesn’t play 78s and includes no wannabe-DJ features. It doesn’t have its own preamp either. While the AT-120 (and, to an extent, the 60) are aimed at consumers who like flash and features, the RP-1, with its medium-density fiberboard plinth and noticeable lack of controls and adjustments, is elegantly understated. Its hand-assembled, straight tonearm is arguably preferable to the 120’s S-shaped arm. The 120 might have a slight advantage in the cartridge department, and it much easier to set up and get spinning. 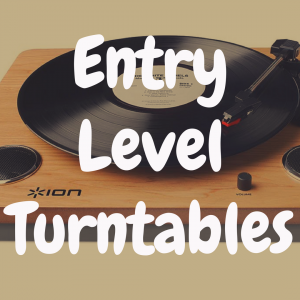 U-Turn Audio has lately been turning heads with its line of midlevel turntables, and the Orbit Plus (list price, about $300) certainly has its strong points. Much like the Rega, it is a minimalist, fully manual, belt-driven table and comes with an outstanding cartridge, the Grado Black 1. And, like the Rolling Stones’ “Rainbow, “ she comes in colors – black, white, red, green and blue. For those who care about such things (and many do! ), the tables in the Orbit line are hand-assembled in Massachusetts. One other “feature” – the belt is visible as it turns the platter, something typically seen only on ultra-high-end tables. It’s pretty much ready to play out of the box. Moving to the top of the line is the best Audio-Technica turntable, the AT-LP1240-USB, the company’s flagship model. At around $400, it genuinely is a “pro” model that Audio-Technica itself states is “primarily for DJ use in nightclubs, touring and mobile applications.” It is, in short, a rugged, lug-it-around beast, weighing nearly 28 pounds. It’s every bit the table that the 120 is, but even more solid and imposing. It comes in your favorite color–as long as your favorite color is black. Important note about this table: You must purchase and mount your own cartridge. Appearance and features are what set the AT-LP120 apart from the competition. As mentioned above, a large number of vinyl devotees are taken by the (most often) silvery finish, slide controls, garish platter mat and the overall “in your face” look and feel of this turntable. It doesn’t appear to be a record deck that has to be treated with kid gloves. And a lot of audiophiles in fact relish the amount of setup and adjustment that this turntable requires. 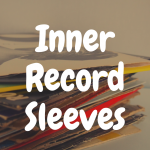 Moreover, transferring vinyl to MP3 is becoming more popular every day, and there are few turntables of this quality that will allow you to do just that. Add the excellent cartridge and the other features, and you have a turntable that should appeal to a very diverse crowd of record lovers. So much of this, of course, is based on personal preference, not to mention how much you want to spend. 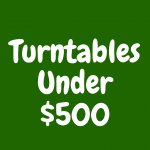 Are there “better” turntables out there? Of course there are – and lots of them, with much more sophisticated materials and electronics and more storied and luxurious pedigrees. But you’d be hard-pressed to find that “better” table with this price tag on it. 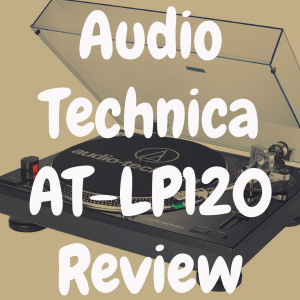 All things considered – price, build, performance, and features – we’ll give the Audio-Technica AT-LP 120 our highest rating: ***** out of *****. What’s the Best Audio Technica Turntable?